Sign language interpretation is provided. Congregations meet the criteria for displaying this symbol by providing a qualified interpreter to assist with communication between persons who are deaf and those who do not know sign language. This typically means interpretation between American Sign Language (ASL) used by the Deaf community and spoken English, but may also be met by providing interpretation into another sign system typically used by persons in that local community. ____ Sign language interpretation is provided. Please indicate the sign language system used. ____ ASL. Interpretation in American Sign Language is provided. ____ Worship. Sign language interpretation is provided in at least one main weekly worship service. ____ Classrooms. 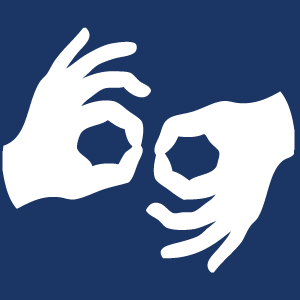 Sign language interpretation is provided in educational settings for persons who need it. ____ Social Functions. Sign language interpretation is provided for informal social activities.